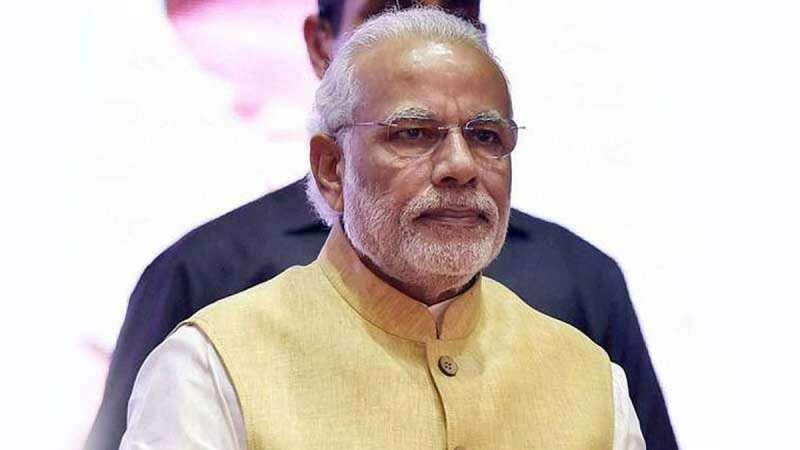 Thane (Maharashtra) : Virtually kicking off the BJP campaign for 2019 elections, Prime Minister Narendra Modi targeted the Congress governments for various lapses while laying foundation stones for Thane district Metro Rail and a mass housing project here on Tuesday. In Kalyan, Modi performed the ground-breaking ceremony for the Thane-Bhiwandi-Kalyan Metro and the Dahisar-Mira-Bhayander Metro corridor projects to ease the transportation problems in these bustling towns, at an estimated cost of around Rs 33,000 crore. Simultaneously, he also laid the foundation stone for an ambitious project to construct 90,000 homes for poor sections of society under the Pradhan Mantri Awaas Yojana (PMAY) to be completed within three years. Speaking on the occasion, he said Mumbai and Thane are expanding and exerting huge pressures on the local resources, especially road and rail transports. To mitigate the sufferings of the masses, many efforts have been taken up to improve the transport systems of the two cities in the past four-and-half years of the Bharatiya Janata Party (BJP) government, he said. "India is the world's only country where urbanisation is taking place at a fast pace. Mumbai is the centre of economic activities and will further expand in the coming time. Hence transportation is a vital link to the development of any city or the country," Modi pointed out. Targeting the previous Congress government, he said the first Metro project in Mumbai was taken up in 2006 and after eight years, only 11 km was started in 2014. "We don't know why it was stuck. After 2014, we decided to increase the pace of laying Metro lines and the scale in the form of a Metro Net in the city. It will add 35 km within the next three years and between 2022 and 2024, Mumbai will have have around 275 km of Metro network," Modi said. To mark the Platinum Jubilee (75 years) of India's Independence, he said the government is moving to ensure that every family in India has a permanent home to live. "The goal here is to build 90,000 new homes for the poor which I am told will be ready in three years. Maharashtra will get 800,000 new houses for the weaker sections under the PMAY. Under this, we are directly crediting Rs 250,000 loan into the bank accounts, besides helping the lower and middle classes to get bank housing loans," Modi said. He said with the Real Estate Regulatory Authority (RERA) getting notified in most states, Maharashtra became the first to implement it, and it has resulted in huge transparency in all housing deals, which did not exist in the past 70 years. "Around 35,000 real estate projects across India and 27,000 real estate agents have been registered under RERA. According to a report, the speed of buying new homes has doubled in the past seven-eight months compared to the previous year," Modi pointed out. He reiterated that in the final four years of the previous UPA government, only 2.55 million homes were construction, but in the past four years of the present NDA government, 12.50 million houses have been constructed under the PMAY. Present on the occasion were Maharashtra Governor C.V. Rao and Chief Minister Devendra Fadnavis besides other dignitaries and he later departed for Pune to lay the foundation stone for a Metro project there.